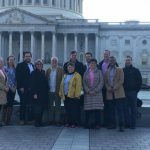 From 7th-13th April a group of 10 faith leaders and organisers from Britain and Ireland met in Washington D.C on the ‘Migrant Learning Exchange’. This visit, organised by the Belfast based ‘Social Change Initiative’ was intended to explore learning, and sharing of best practice between the US and Britain and Ireland on issues around migration, asylum, and refugees. Connected through Scottish Faith Action for Refugees (SFAR) Scotland was represented by Danny Sweeney (Co-ordinator for Justice and Peace Scotland) and Mohammad Omar (Policy and Development Officer (Refugees) for the Mental Health Foundation). During the visit delegates met with faith based groups, and people of faith working in various ways. We had a none-stop programme, but I wouldn’t have had it any other way. For two days we were based out of the Methodist Building; a stones’ throw from the Capitol (which houses the US Congress). We met with several of the groups (including the US Conference of Catholic Bishops) who take responsibility for refugee resettlement. This issue is one of many which the Trump presidency has threatened. The situation in the US is quite different to the UK. Here the majority of refugees enter as asylum seekers and are granted refugee status by us, whereas in the US there is a long tradition of refugee resettlement, where people already granted refugee status are resettled in the US. (This does happen in the UK but on a much smaller scale, about 750 per year under a programme called Gateway, along with the recent Syrian resettlement which aims to bring in 20,000 over 5 years) In the US refugee resettlement has traditionally enjoyed bi-partisan support with around 80,000 a year being accepted, and refugees seen by both Democrat and Republican as “good” immigrants in the tradition of Ellis Island. When coming to power Trump immediately capped intake for the current year at 40,000 and all agencies tell us that they will be unlikely to see more than 20,000 actually resettled this year. More than one agency told us they expect that they will see a complete ban next year. We also met with people on the frontline. On the Wednesday we travelled out to Pennsylvania to the cities of Lancaster and York. Lancaster is the ‘Refugee Capital of the US’, taking in more people per capita than anywhere else. We heard from Church World Service (who were also our hosts in Washington) about the 300 years of welcome in Lancaster, going back to the foundation of the state by William Penn who famously stated “Strangers are welcome as there is room enough for all”, and envisioned a place where immigrants would always find themselves accepted and included, something reflected in the language of the state charter. More recently Lancaster found itself located near to where Vietnamese refugees were sent in 1975, making them one of the communities local enough to sponsor their release from detention. It is a point of pride for many in the town to know their own family histories, and they “remember both what it is to be welcomed, and to welcome others”. In York, the site of York County Prison which holds both criminal and immigration detainees we met with PIRC (Pennsylvania Immigration Resource Centre) an advice and advocacy group who work with detainees. PIRC came about following the detaining by the Clinton administration of the survivors of the shipwrecked Golden Venture in 1996 in an attempt to dissuade traffickers. PIRC have seen their workload increase under Trump as ICE (Immigration and Customs Enforcement) have increasingly aggressively targeted ‘deferred action’ individuals (those who have been told they would be ok to remain even with unresolved immigration issues) and now empowered by Trump’s rhetoric are considered completely off the leash. It wasn’t all meetings and work though. On the Sunday I had the chance to visit the National Basilica of the Immaculate Conception; the US’s national shrine. I visited the crypt where Dorothy Day, the co-founder of the Catholic Worker movement went and prayed for a way to help the workers and the poor, just before she met (the other co-founder) Peter Maurin and began their work, which was recognised by Pope Francis when he visited the US in 2015. 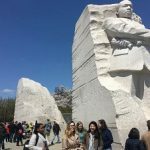 I later explored the National Mall, and the monuments to various Presidents, and most importantly for me, Martin Luther King Jr; the great US prophet of Christian nonviolence, who like so many others found himself martyred for his witness. Many of those who we met identify with Dr. King’s tradition of civil rights; these are communities who are part of the US, not outsiders or aliens, they are there, working, worshiping, being part of communities and see the struggle of the African-American community in continuity with their own. I left the US both hopeful and fearful. Many, including Greisa, Jason, and Rep. Cleaver spoke to us of ‘being the Resistance’. For many Trump’s policies, and the emboldened far-right are impacting them in very real ways as communities and traditions of welcome are destroyed. Those whose beliefs are antithetical to our values as people of faith are organised across international borders. We have to do the same to proclaim our values and practice them in our communities, and communicate them to our political leadership. At a time when we have 65.6 million people displaced, more than any other point in history, we are seeing the rise of a populist rhetoric against them. I saw in Calais last year how the UK is failing so many young people, now stranded in northern France, and across the continent and beyond the world is building walls not bridges. It was an empowering feeling to sit, a mater of meters from the heart of US political power and be sharing stories with so many people whose faith compels them to resist the hatemongering and fear which is being targeted against the undocumented, the Dreamers, Muslims, and refugees. To hear of Christians, Jews, Muslims and others who are prepared to amplify the voices of those who are impacted, and stand in solidarity with them. I could go on even more, but two messages have come back with me and inspire hope. The first from the abolitionist Theodore Parker, paraphrased by both Dr. King and Bend the Arc; “I do not pretend to understand the moral universe; the arc is a long one, my eye reaches but little ways; I cannot calculate the curve and complete the figure by the experience of sight; I can divine it by conscience. And from what I see I am sure it bends towards justice.”. The second from Sojourners; a Christian community and media platform who we met with, whose poster is now on my office wall (breaking our ‘no blue tack’ policy!) “I pledge to protect and defend vulnerable people in the name of Jesus.” #Matthew 25.